Dale Talde’s Restaurant Group Is No MoreThe chef still has the Jersey City location of Talde. 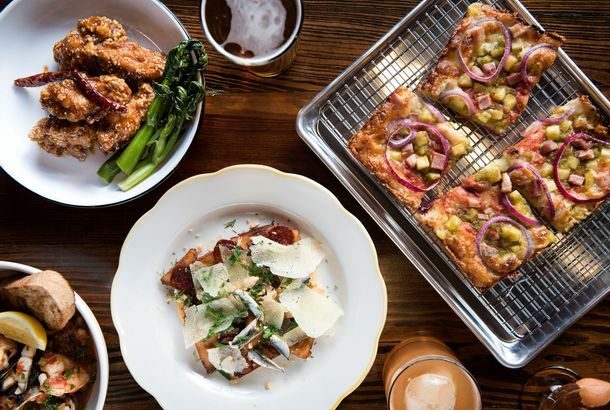 Dale Talde Will Serve General Tso’s Chicken Wings at Atlantic SocialAlong with pan pizza, potato skins bravas, and fried chicken. 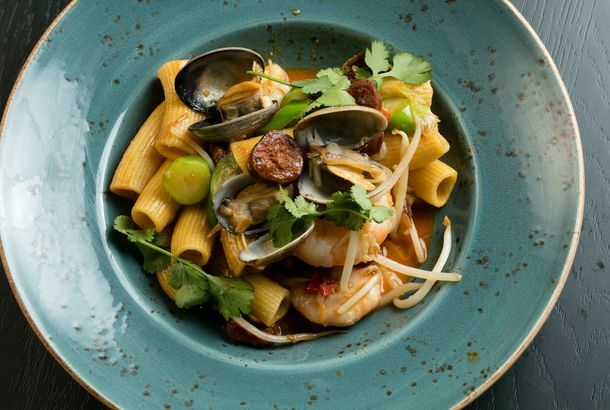 Here’s a First Look Inside Dale Talde’s New Italian RestaurantThere’s rigatoni with XO sauce and pan pizza on the menu. Talde’s Speedy Romeo Pie; Aldea’s Festa do LeitãoAnd more, in today’s Leftovers. Dale Talde Bringing Roberta’s, Toro, and Others Together for TyphoonHelp out by eating out. The Farm ’s Kickstarter; Talde ’s Typhoon Haiyan ReliefPlus: El Toro Blanco’s Tequila Tuesdays, and more, in today’s Leftovers. Dale Talde Writing ‘Proudly Inauthentic’ Talde CookbookChive-pretzel pork dumplings for all. McDonald’s Enlists Genuine Chefs to Help Convince People That Its Food IsIt’s like the movie ‘She’s All That,’ but with McNuggets, or something. Chez Sardine’s Spring Brunch Menu; the Marrow Launches LunchPlus: Dale Talde’s lecture at the Brooklyn Museum, and more, in today’s Leftovers. Dale Talde and Chris Jaeckle Showdown at Thistle Hill TavernTwo chefs, four courses. Everyone wins. Here’s Dale Talde’s New Menu for Thistle Hill TavernBig ol’ pork chops and grass-fed burgers. Dale Talde Is Now the Chef at Thistle Hill TavernPork Slope indeed. Pork Slope Expanding Its Weekend HoursDale Talde’s bar will be open starting at noon on Saturdays and Sundays. What to Drink (and Eat) at Pork Slope, Opening Next Week in Park Slope A “Brooklyn roadhouse bar” from the owners of Talde. The Year of Asian Hipster CuisineAmerican cooks who found their calling through passion, not ancestry. More on Dale Talde’s Second Park Slope Joint: Think RoadhouseThe bar will be all-American, with chicken wire! Dale Talde Planning Park Slope TakeoverHe’s scarcely opened Talde and is already planning another restaurant for the Slope. What to Expect From Talde, Dale Talde’s UpcomingDale Talde shares some details about his upcoming Park Slope restaurant. Top Chef Alum Teams Up With Thistle Hill Tavern Team for Asian SpinoffDale Talde will be the chef at the yet-to-be-named restaurant. Dale Talde’s Bodega Will Pop Up This SaturdayThe ‘Top Chef’ toque’s “family meal” costs $100 a seat. ‘Top Chef’ Dale Talde Cooks, Dishes Tonight at Astor CenterEveryone’s favorite faux-hawked ‘Top Chef’ alum cooks tonight at Astor Center. ‘Top Chef’ Classes All Set at the Astor CenterNow is your chance to fondle Dale’s ‘faux’-hawk. $2K Tables in the Hamptons; Ex-Cons to Serve You Booze Soon?Plus details about Kenny Shopsin’s cookbook, why Dale cried on ‘Top Chef’ last week, and more, in our morning roundup of news and gossip. Latest ‘Top Chef’ Departee Feels Like a New York Knick“I will never in my life surround myself with such negativity,” says the latest cheftestant to leave the show.